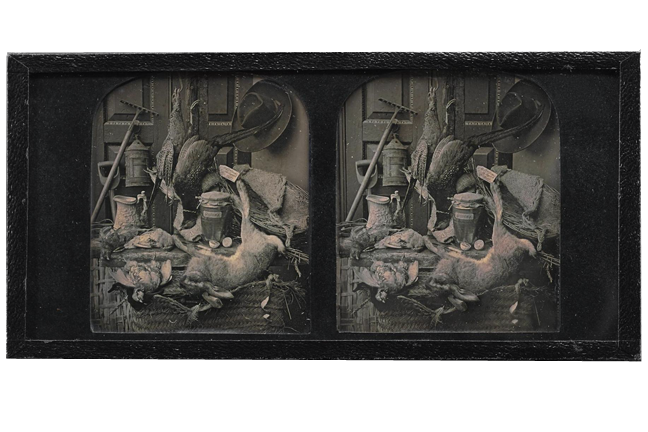 TR Williams’s earliest work involved making daguerreotype and wet collodion stereos of intricately arranged animals, fruits, vegetables, skulls, books and other items. 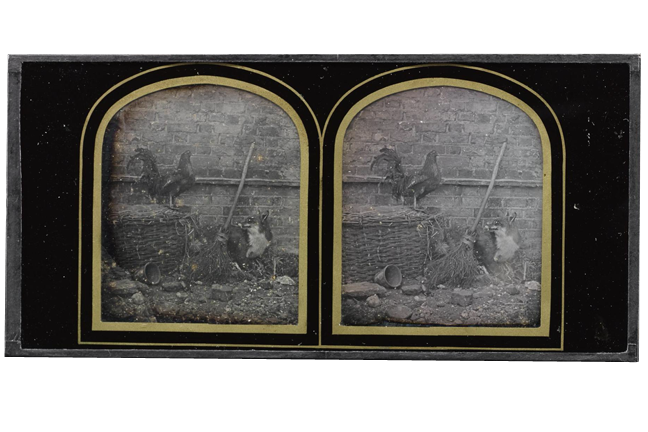 Still life subjects enabled early stereo photographers to experiment with fewer challenges than when using live models, where long exposure times would not always capture movement. 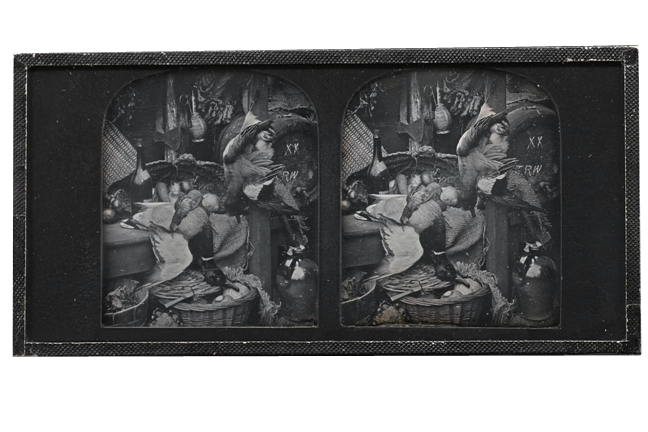 Here are some further examples of still life stereo images by TR Williams. At the top of this section is ‘Scenes in Our Larder (Onions), a still life of game, and a fish basket, tied with a luggage label scrawled with ‘Mr TR Williams 236 Regent St. London’. It is no. 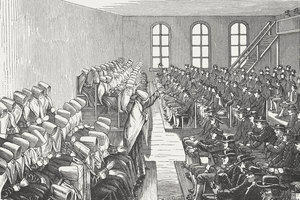 27 from Williams’s ‘First Series’ which was advertised in Brewster’s Treatise on the Stereoscope. Below, we see The Old Larder, a still life of food and wine on a table, and a barrel with the initials ‘TRW’ etched on to it. No. 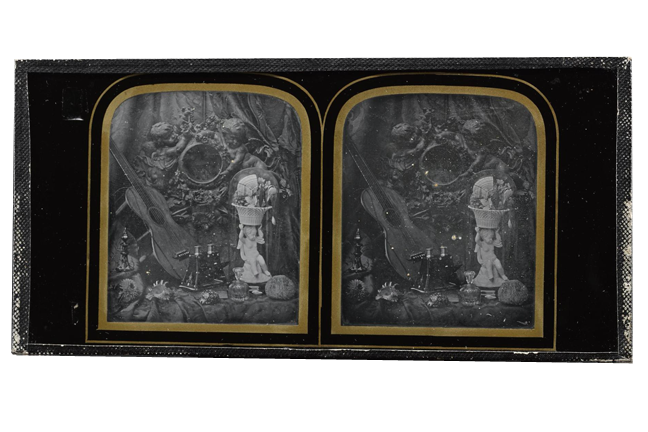 4 from Williams’s ‘First Series’ advertised in Brewster’s Treatise on the Stereoscope. With a trade label on the back for the sellers, Carpenter & Westley of Regent Street, London. ‘The Poor Man’s Picture Gallery’ by Denis Pellerin & Brian May, Carlton Books, 2014.